Does your job require you to assume command of emergency response incidents involving hazardous chemicals or materials? May you be responsible for assuming the role of the Incident Commander during a Hazardous Materials response? Our online OSHA Incident Commander training course provides certification to the Incident Commander level, as required by 29 CFR 1910.120 (q)(6)(v), Incident/Scene Commander as part of the Incident Command System (ICS). Take our online training course in your spare time. Receive 0.8 CEUs and an OSHA Incident Commander certificate. Fullfill your OSHA training obligation. Do you want to be, or perhaps already are, someone who is responsible for an emergency situation involving the release or potential release of hazardous materials? You are someone who should be trained as an Incident Commander according to the OSHA regulations outlining the Incident Command System (ICS). You could be someone responsible for emergency response at a fixed site such as a manufacturing or chemical facility. You might even be a Public Safety person in the Police, Fire or even Emergency Medical field. Our online training course is designed for someone already trained to the OSHA First Responder Operational (FRO) level or higher, since you will already have a foundational understanding of the OSHA Incident Command System (ICS). 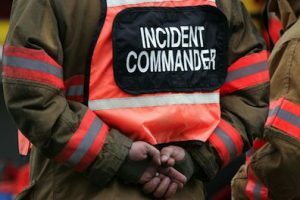 Our online Incident Commander certification provides you with the training to safely and effectively command an emergency response incident whether your position is with a public (such as fire or police department) or private organization. Our online training certifies you to be an OSHA Incident Commander, which is a position required at every emergency hazardous or chemical incident response. It fulfills your OSHA training requirement under 29 CFR 1910.120 (q) for Incident/Scene Commander. An understanding of the role of the first responder awareness in the employer’s emergency response plan (including site security and control), and the U.S. Department of Transportation’s Emergency Response Guidebook. Know how to select and use proper Personal Protective Equipment (PPE) provided to the first responder operational level. Know and be able to implement the employer’s incident command system. Know and understand the hazards and risks associated with employees working in chemical protective clothing. Know how to implement the local emergency response plan. Know of the state emergency response plan and of the Federal Regional Response Team. Know and understand the importance of decontamination procedures.